Former congressional staffers reveal best practices for making Congress listen. They say "We believe that the next four years depend on Americans across the country standing indivisible against the Trump agenda. We believe that buying into false promises or accepting partial concessions will only further empower Trump to victimize us and our neighbors. 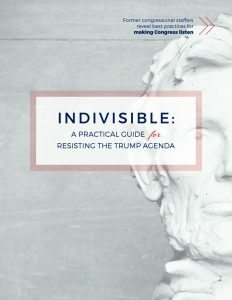 We hope that this guide will provide those who share that belief with useful tools to make Congress listen." Please submit a link today if you think we should add it. Thanks for adding the link! We’ll take a look and add it soon.